OKLAHOMA CITY (AP) -- For the second time in less than a week, Kobe Bryant and the Los Angeles Lakers must figure out how to fight back after a humbling loss. This blowout came four days after Bryant's Lakers trailed by as many as 28 in a loss at Denver, then bounced back to win Game 7. They'll need to find some answers before Game 2 in Oklahoma City on Wednesday night. "I've seen both sides of that equation and my experience has taught me just to be patient and to think the game through," said Bryant, who tied Andrew Bynum for the team lead with 20 points. "We can come up with a different strategy and we can do a much better job and have a much better showing in the next game." The Thunder took a 15-point halftime lead, opened the third quarter with a 15-2 blitz filled with crowd-pleasing 3-pointers and dunks, and never looked back. The final margin ended up being the fourth-largest in the history of the Oklahoma City franchise, including its years in Seattle. It matched the 12th-largest defeat in Lakers postseason history, and the sixth worst of Bryant's career. Three of those losses came in close-out games when L.A. was done for the series. Once was the start of a four-game sweep. The other two times, the Lakers came back to win the next game - both during their run to the 2000 NBA title. "We got beat tonight. You can say anything you want to about a seven-game series and us having a day or whatever," Los Angeles coach Mike Brown said. "The bottom line is this is the playoffs, we've got to come to play and we didn't. We got beat. "It's one game, so we've got to bounce back for the next one." 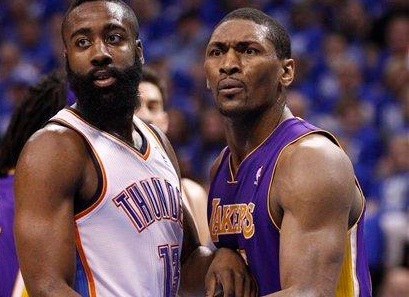 The Thunder didn't need any dirty tactics to get even for Metta World Peace's suspension-worthy elbow that gave Oklahoma City's James Harden a concussion with a week left in the regular season. The league's most turnover-prone team - committing 16.4 per game in the regular season - gave it away only four times, a record low for the franchise. "I think that's huge," coach Scott Brooks said. "Four - we've had that the first 6 minutes of games at times." That gave starting center Kendrick Perkins time - but apparently not enough - to rest a strained muscle in his right hip after he hurt it in the final game of the Dallas series. He limped out of the game after dunking just after halftime and did not return - although coach Scott Brooks said he could have. He will be re-evaluated Tuesday. The possibility of rust had been a concern for Brooks, and he fought it by alternating light days with demanding, training-camp style practices. "There's no question we have a team full of gym rats. They want to play basketball," Brooks said. "That's all they want to do: They want to play basketball. They're basketball players. They probably don't have much of a life off the court." All that pent-up energy came flowing out just after halftime, in highlight-reel fashion. Durant lobbed the ball to Westbrook for a two-handed slam, then connected on a 3-pointer from the left wing to draw a timeout from Brown. That still didn't slow Oklahoma City, which got what could have been a costly two-handed dunk from Perkins on its next trip and then another 3 from Durant before Thabo Sefolosha swiped the ball from Bryant and ran out for a layup that made it 74-46 with 8:39 left in the period. "From then on, it was cruising for us," said Westbrook, who had nine assists against one turnover. Both coaches started going to their benches with 8 1/2 minutes left, and Los Angeles reserve Devin Ebanks ended up getting ejected with 2:18 to play after walking up to a scrum for the ball after the whistle. Official Greg Willard said at the scorer's table that he was ejected for "what he said" in drawing a technical foul. "Obviously, they're more well-rested than we are, but I don't think it made that much of a difference for us," Bryant said. "We could have had the same amount of days off. They're just younger and faster. And tonight, what you saw is them executing extremely well." The buildup to the game focused largely on it being the first meeting between the teams since World Peace got a seven-game suspension for elbowing Harden. He returned just in time to help L.A. win Game 7 against Denver. A sold-out crowd at Chesapeake Energy Arena wasn't happy to see him back, although World Peace - who changed his name from Ron Artest - was hardly fazed by the chorus of boos that greeted him during pregame introductions or again whenever the ball came his way. World Peace knocked down a 3-pointer from the top of the key amid boos the first time he touched the ball, set up a two-handed jam by Bynum and drilled another 3 within the first 2 1/2 minutes. The boos continued throughout the game whenever he got the ball. "Right now, it's about basketball," World Peace said. "After the season we can talk about that but right now it's more about basketball." Notes: Bryant tied former teammate Shaquille O'Neal for the third-most playoff games in NBA history with 216. ... Perkins was called for a lane violation in the first quarter after arguing with Willard about a call and then walking up to his spot along the lane while Bynum was shooting. Bynum made both foul shots when awarded the extra chance. ... Toby Keith's daughter, Krystal, sang the national anthem.